As you know, I have been struggling to get my generator started. It runs for about three seconds and then turns off. Well, my friend John took a look at it today and discovered that a couple of wires had been stripped. It looks like the wood rats of Laguna Atascosa found the wires just before I left. Thankfully, he was able to remove the carburetor and get to the chewed up wires and repair them. What a blessing friends are. I can't imagine what it would have cost to have this repaired, and I don't think any repairman would have driven out here to fix it. After a couple of hours, I flipped the switch and it revved right up. Hallelujah! Thank you John! Temps today got up into the high eighties, but a front is supposed to blow through tonight and tomorrow it will be thirty degrees colder. I'm planning to take a trip to Marble Falls. I'll check the town out and stop to get some replacement rugs for Emma's throne on the dashboard and get her some more dog food. I've had the rugs almost a year and she has chewed off the borders and they need to be replaced. Hopefully she is beyond the puppy chewing stage and the new rugs will last longer. She does enjoy the view out the front windows. Just before we came inside this evening, the coyotes began howling. I've seen a lot of evidence of their presence ;), but this is the first evening I've heard their serenade. On Emma's 'first outs' this morning, there was a flock of turkeys gobbling a short distance away. I do enjoy residing in wildlife refuges. Today was the training for the educational programs we will be presenting to visiting school groups that will begin arriving in March. Oh my goodness, it was a long day. There are only two programs that we present: Bridges to Birding and Going Buggy, however, each program has eight stations and different information and activities are presented at each station. That's a lot of material to go over in one day. There were some activities where we got up and moved around, but most of it was like sitting in a classroom. The presentations by Rob and some other presenters were good, but it just seemed the day would never end. There were about 21 folks attending besides the six RV volunteers. It was a successful day and many people signed up to volunteer on the days that are already scheduled. Eventually, the RV volunteers packed everything into our van and Diana and I headed back home. The training was out at the Flying X ranch, so it was close to five by the time we got home. We all relaxed outside for a while and now it's time for a glass of wine and some dinner. 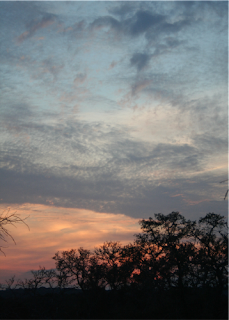 I was up and out a little earlier this morning, and headed for Warbler Vista for the bird survey. It was a pleasant three mile hike, but only a Swainson's Thrush to give me a slight rush. Very few other birds were seen or heard. I did the Post Oak Creek trail near the headquarters afterwards, and again saw more birds there than at the more remote trails. My friends, Diana and John, arrived this afternoon, and it was enjoyable to chat with them. Tomorrow, Diana and I are off to the Flying X for the educational program training. I forgot to ask John if he would walk Emma for me tomorrow as it is an all day training. I'll have to do that in the morning. Emma just loves John. So today I had to survey Rimrock Trail again for birds. It was sunny and warm and it was an enjoyable morning. I headed out down the 2.2 mile trail. I had to cross the creek over those stones. Luckily the water is low, so it was an easy task. Then it was up and up and up. The trail leads to the top of the hill. My walking stick helps me get up and down the steep parts. Prickly Pear Cactus can be found along the way and at the top. The tree in the back is an ash juniper. Ash juniper is prime nesting habitat for the golden-cheeked warbler. None have arrived from the south yet, but it won't be long. The views from the top of the hill are outstanding. To the far right is where I parked the refuge van. 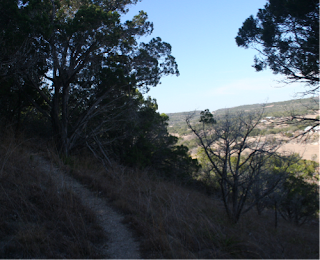 Then it was back down the trail to do two other trails out at the Doeskin Ranch. I didn't see huge numbers of birds, but what a day to be outdoors. By the time I got down, it was close to eighty degrees and no mosquitoes. You can't ask for much more than that. I spent the afternoon working in the office doing further work on the education programs. When I got back to the rig, about 4:30, there was a small flock of chipping sparrows joining the house finches, titmice, and American goldfinches at the feeder. The birds went through a full feeder of food today, so I restocked before heading inside to make some brocolli soup from scratch for dinner. Tomorrow, it's back to Warbler Vista for another bird survey, and then I'll welcome friends, Diana and John, to the refuge. I've enjoyed my solitude up here on the hill, but both Emma and I will appreciate some neighbors. Sorry for the duplicate picture. Don't know why that happens some times. Do you remember that soap opera, "As the World Turns"? I think that was my "distant" cousin Jean's claim to fame back in the fifties. I'm not sure if it was "As the World Turns" or "The Edge of Night." It was whatever soap that came out of Chicago and she had a minor role at some time. I'm also not sure why she was always referred to as "distant" cousin Jean. I grew up in a rather small family, so how distant could she be? She didn't live far from us in Chicago and we had cousins that weren't distant in Peoria! It's funny where your mind goes at times. Anyway, as the world turns in the hill country of Texas, the winds have also changed. They started to come out of the south this afternoon with the promise of warmer temperatures. It was only 25 when I got up this morning, but tonight it is only supposed to get down in the forties. I'm happy with that. I made a trip to Cedar Park late this morning for groceries and stopped at an A & W for lunch while I was there. I could tell I was in Texas because there were jalapeno peppers in little bags that could be added to your entre. I, of course, passed on that opportunity! I'd like to find a good Chinese place to eat. People rave about Texas BBQ, but I can say that I've had my fill of that fare. I'm planning to go to Fredricksburg in the near future to enjoy a good German meal. I had to refill the bird feeder today. That's encouraging. The goldfinches have also definitely found the sock with the niger seed. Maybe I'll be able to get some pictures soon. I really enjoy the black-crested titmice. Back when I was at Laguna Atascosa Nat'l Wildlife Refuge, my friends, Diana and John, and I split the cost of buying a training program that, if followed will result in your canine companion becoming the Perfect Dog. I must say that I have not been diligent in my administration of the prescribed program. :( However, Emma's behavior has improved and I need to get back to the rigors of the program. So, tonight I will order another special collar and a special fetch ball toy attached to a long lead. The new collar will go to John and Diana so their challenging dog, Buffy, can join the program when they arrive later this coming week. Emma has been a real challenge to me and short of calling the Dog Whisperer, I will endeavor to give this program further energy. I still haven't been able to get the generator to work for more than three seconds. I'm hoping John will be able to give me some pointers when he arrives. Temps went down to twenty last night and I'm afraid my tomato plant has had it. It's supposed to warm up as the week goes on. I'll probably buy another plant and try again. Today was spent doing laundry, cleaning the "house", and working on a couple of walking sticks. American Goldfinches, House Finches, Black-crested Titmice, and a Northern Cardinal have visited my feeder today. I guess the birds have finally found the feeder. Well it got a little colder last night than predicted, and the thermometer showed 25* when I got up this morning. If I had known it was going to go that low, I would have detached the water hose. Luckily, I had a bucket over the connection and the hose didn't freeze. Another good thing is that there was hot air pumping out of the furnace this morning, so I guess it was a figment of my imagination yesterday that there was cool air coming through the vents. I had several items to take care of today. One was calling my financial adviser and I was shocked when she was actually in her office and able to speak to me. I also had to take care of some other bills. I had gotten two different insurance bills in the mail earlier for the new car. I wasn't sure which bill to pay or if I needed to pay both. I called the insurance company and was surprised to find out that I only owed the smaller of the two bills. The day was surely off to a good start. The sun eventually warmed things up and Emma and I took a couple of enjoyable walks in the countryside. This afternoon, I tackled all of the magazines that had been piling up for the last few months, read through them, and deposited them in the recycling bin. That eliminated a few pounds from the rig. As the sun began to set, I headed inside to have dinner. I had a pork roast cooking all day in the crock pot and made pulled pork BBQ to eat. I revved up the motorhome engine to keep the battery charged. I do this once a week after having experienced some issues with a dead battery. It seems to work. Then, I hopped up to get the generator going for it's once a month workout. After so many good things today, it was disappointing to me when the generator didn't want to crank up. I'll give it another try tomorrow. I'm not good with engines, so I'm not too hopeful. All in all, a positive day with only one bump in the road. After a slow start this morning, I headed for Warbler Vista to do the bird surveys for Cactus Rock and the Ridge Trails. Not much birdlife was evident, but I did hear a new bird for me for this refuge: the spotted towhee. It was not terribly exciting, but the three mile hike did me good. When I got back to headquarters, I birded the Post Oak Creek Trail and results were similar to last week; more birds along this half mile trail than at either of the other trails. 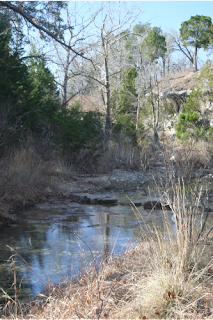 Of course there is water along this trail and that makes a difference during these severe drought conditions. After lunch, Emma and I spent a leisurely afternoon. I did some computer surfing and worked on another walking stick while Emma patrolled our front yard. I also tried to make some guacamole for the first time. It was okay, but nothing to write home about. It was a nice sunny day, but the temps were twenty degrees colder than yesterday....no shorts today! Did you ever wonder where certain sayings come from? For example, "Let the chips fall where they may"; I kind of thought that had something to do with poker. But then this afternoon while I was working on a hobby of mine, I decided it might come from the chips from chopping wood. So, anyone else have an idea? 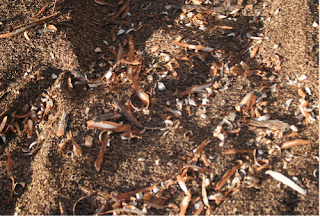 These are wood "chips" from my work on walking sticks. In 2004, I, my then 87 year old mother, and my daughter, went on a trip to Alaska and I was introduced to diamond willow walking sticks. 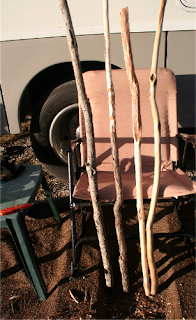 I ended up buying some unfinished sticks in Fairbanks and spent that fall turning them into walking sticks. I really enjoyed that and after I hit the road in 2006 I tried to figure out a way to get more sticks to work on. In January of 2007, I went to Quartzite, AZ, and found a stand that was selling some unfinished sticks. Then, last summer, my friends Diana and John went to Alaska and I asked them to pick up some more sticks for me in Fairbanks. They did that, and I now have about 15 sticks to work on. The stick on the left still has the bark on it, the second from the left has a little of the bark off, the next one has all the bark off and is awaiting sanding and finishing, and the last stick is one that I finished after Alaska and have used for almost five years. So, what am I going to do with fifteen walking sticks? I don't know. Anyone in the market for a diamond willow walking stick? Let me know. Laminator Queen for a day. It's been a few days since I posted, and that's because I haven't had internet service. I gave the antennae a little twist the other day thinking it might improve reception, and then the overcast and fog moved in for a couple of days. I don't know which had the detrimental effect on my reception or maybe it was a combination of both. Anyway, today the air cleared and I twisted the antennae back to where it was and viola! !, I have reception tonight. Yesterday, I worked the entire day in the office since it was chilly and there was mist and light rain all day. I spent eight hours running the laminator and getting more things ready for the educational programs. Not exactly exciting, but it was work that had to be done. The training for the ed. programs is next week, so everything needs to be ready and nobody else seemed to know how to run a laminator. I'm going to publish this now, in case my reception quits again. I'll try to post more later. My first bird feeder visitors! As it turns out, I didn't do the hikes at Doeskin Ranch yesterday, as I had already put in my twenty hours for the week. Shockingly, Emma let me sleep in until almost seven Friday morning. There must not have been any interesting critters outside in the early morning to get her all revved up! I appreciated the extra time in bed. It was a glorious sunny day with temps reaching the low eighties. We spent most of the day outside with several longs walks and I even had to get the air conditioner running to keep the inside of the motorhome at a desirable temperature. It sure heats up in the direct sun. The weather changed today, and I awoke to cloudy skies and the temps eventually only made it to sixty. I bundled up and Emma and I headed out up the hill for another exploratory hike of the area. I took my binoculars along this morning, and of course all the birds that were singing and flitting around yesterday were in hiding today. After we got back, I got ready for the drive to Cedar Park for errands. It's a seventeen mile drive up and down through the hills. I needed to pick up some fresh fruit for the potluck brunch tomorrow at the Flying X. There will be five volunteers there and maybe two of the interns. I always enjoy the potlucks. It will also give me a chance to talk to someone besides Emma. The sun is supposed to come back out tomorrow, and I look forward to the brunch. This was the sunset before the very windy storm with rain and a bit of hail the other night. Who would have guessed? I'm not sure I'm glad I bought that new thermometer! When I got up this morning, the reading was 32*. I didn't need to know that. It was chilly when Emma had her first outs, but I didn't think it was that cold. Anyway, after breakfast, I headed out for Warbler Vista for my first bird census. I started out on Cactus Rock Trail which led into the Ridge Trail which ended up at Sunset Deck. Those two trails go up and down and around in old growth Juniper forest which is prime habitat for the endangered Golden-cheeked Warbler. Of course, the warbler hasn't arrived from the south yet, but Chuck, the biologist, wanted a bird census leading up to their arrival in about three weeks or so. I looked and listened for birds all along the close to two mile hike, but was only able to find about three birds. The trail was not exactly thriving with bird life. The view from the Sunset Deck was pretty nice. That's Inks Lake in the distance and the road to where I'm staying on the right. It turned out to be another mile hike back down along the road to the parking lot where my refuge van was parked. Sure glad there was a port-potti in the parking lot. It had taken me about 2 and a half hours to do that circuit. I saw more birds walking the road than I did on the trails. All together I saw black-crested titmice, cardinals, turkey vultures, black vultures, and a red-tailed hawk. Today will provide a baseline for later hikes; hopefully with more species each week. I drove home, took Emma out, and had lunch. Then it was down to the office to take the creek trail and document more birds. That short half mile hike resulted in more birds than I had seen all morning. There was a nice group of ring-necked ducks on the pond and I saw bluebirds, Eastern phoebes, more black-crested titmice, and a group of American goldfinches working the balls on the sycamore trees by the creek. 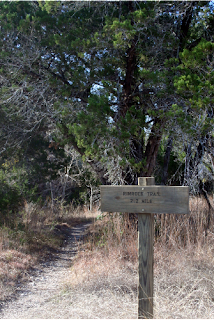 Tomorrow, I'm going to do several of the trails at Doe Skin Ranch for more bird surveying. It should be about the same amount of miles. I'm going to try wearing hiking boots tomorrow with more ankle support and see if that helps. Last night's storm seemed to have left by 10:30, however, another blast of very high winds moved through at about two in the morning. These winds were strong enough to wake me up and fairly rock the motorhome. I listened for a brief time and then floated back off to sleep. The forecast for the day was continuing high winds, so I decided to fore go my bird surveys and spent the day at the office working once again on the education program supplies. Not exactly my favorite type of work two days in a row! Before I left for work, I had to find out where my small outside table had migrated to in the high winds. Eventually I found it quite a distance away, and after work, I re-established my outside patio area. This was after a quick trip to Lago Vista for milk and a few other supplies. It turned out that every Wednesday is senior day at Ace Hardware, and if you're over sixty, you get a 15% discount. So, I stopped there and purchased some light bulbs, a large plant saucer to use as a bird bath, and a thermometer so I know what the outside temperature is. I had been using a very ugly thermometer with suction cups on the outside of the rig, but it bit the dust in my recent travels. I now have one that sticks to a window and is large enough to actually read without my glasses. Why did I wait so long to get one of these? I just peel it off when I'm ready to roll and put it back up on the shaded side of the rig when I arrive at a new location. I finally found a Texas grocery with corned beef available at the deli section, so tonight it will be a Rueben sandwich for dinner. I even have some kraut on hand, if you can believe that. Mmm, mmm. Tomorrow, I'll definitely be doing some bird surveys and hope to get some pictures. I was peacefully watching the Westminster Dog Show when I noticed that Emma was hiding under the booth table. That's unusual. Then a warning came on the TV screen about a severe storm approaching. Since it was almost 9:00, I decided to take Emma out. It's a good thing I did. The wind was beginning to pick up, and as soon as Emma finished her business, I decided to take the BBQ grill off of the table and set it on the ground. I also upended my small outside table and slid it under the motorhome. No sooner had we returned inside, and the wind dramatically picked up, rain began to pour down, and some hail began to fall. The satellite connection went out and the thunder rolled! The front moved through in about a half an hour and things have calmed down. The winds have appparently altered my DISH position as I still don't have a satellite connection, but the rains have stopped and the winds have died. I guess it's wise to watch for Emma's premonitions. I spent Monday catching up on those little chores around the rolling house that aren't exciting, but are essential...things like dumping the tanks, vacuuming, and tightening down screws that had become loose during travels. This was done in between showers. There was more rain yesterday than had been experienced here since last October. Still, it only amounted to maybe a half an inch. This area has been in a more than extreme drought for the last 17 months. This morning, I headed out for the office for my first real day on the job, and spent the entire day inventorying and organizing the educational programs about birds. I worked with fellow volunteer Connie. We will also be doing the same thing for the bug programs some other day. I talked to Chuck, the biologist, and tomorrow I'll be starting some bird censusing out at Warbler Vista. I'm sure I'll enjoy that more than the inside work. Chuck and Rob seem to be somewhat at odds as to where I will be doing most of my work. I signed up to work with Chuck on bird stuff. Seems I may have to make this more clear to Rob. There is a tornado watch posted for this area this evening. I folded up my chairs and put them under the motorhome before coming in this evening. Hope the high winds pass me by. Time for the dog show! It's been pretty uneventful today. The winds have been very strong today and tonight out of the south, but the temperatures have remained mild. I did identify a small flock of Vesper Sparrows out the window this morning, but no birds have found my feeders yet. I did a few little chores around the rig today and went on several walks with Emma to further explore the area up on this hill, but other than that, it was a peaceful and restful day. Well, it's now Saturday night, and I can't say I did much of anything important yesterday. Emma and I went on several walks, and I played on the computer, washed some windows, and hooked up a second hose to the water outlet. In the late afternoon, I headed out for the home of Dub and Ruth Lyon, some local volunteers, who had invited all the present volunteers for dinner. What a nice home they have in the hills about four miles from here. The food and conversation were enjoyable and we were treated to a visit by a gray fox as I got ready to leave. A couple of foxes come by every evening for handouts. After lunch today, I hopped in the car and turned on Cow Creek Road on my way to visit the Flying X Ranch where the other volunteers have sites. The road is aptly named. Everyone was out for the afternoon, so I just looked around the ranch house that is there and left. I stopped briefly at Doeskin Ranch on the way. Both of these former ranches are now part of the refuge. I will return to Doeskin again to do the trails. After breakfast and a mile walk for Emma, I walked down the hill to the refuge office for a morning orientation. I decided to walk since I was hoping to be assigned a vehicle for use during my work. It was a good decision. At the end of the three hour orientation, I was assigned a van. I headed back up the hill to take Emma out and have lunch. After lunch, I met with Chuck, the refuge biologist, and we discussed possibilities for my time here. It looks like I may be doing some bird surveys and tours mixed in with inventorying the school education program supplies and various other projects. Doing trail maintenance is one of the chores I think I will especially enjoy. There's nothing like being outdoors to see and hear all that nature has to offer. After gassing up the van, I headed back to camp to do some further set up and to enjoy my rocker. Three Red-tailed Hawks put on a display while catching the thermals and playing in the wind. Temps had risen to the low seventies under sunny skies and it was a beautiful day to be outdoors. Emma and I did some more exploring of the rustic vehicle paths on top of the hill and I threw an Italian sweet sausage on the grill for dinner. Tomorrow I will do further exploring of the refuge and take the van into town for an oil change. Emma and I were up by 6:30 today, and as soon as I hopped out of bed, I revved up the furnace. It was a toasty 68* inside in short order. After breakfast, we went on a half hour walk and explored some of the territory surrounding our site. Peggy and Paul, two of the other volunteers, were picking me up at 9:00 for a driving tour of some of the refuge. Connie and Chris, another new volunteer couple, were with us also. We got the low down on the maintenance area and headed out for Warbler Vista. This refuge is still in the acquisition stage with scattered parcels of land owned by the refuge and plans to acquire surrounding acreage to tie it all together. Warbler Vista has foot trails that weave through the forest which is prime Golden-cheeked Warbler habitat. The warblers are not here yet, but will begin to arrive early in March. One of the main goals of this refuge is to maintain and acquire suitable nesting habitat for this endangered specie. We gathered our tools from the back of the vehicle, and headed out to do trail maintenance on a couple of the trails. Trail maintenance consists of raking leaves off of the trail, removing tree roots that walkers could catch their feet on, and eliminating any rocks that might cause a person to twist their ankles. We cleaned up about a mile and a half of trail and also worked on stabilizing several benches on the trails that were put there by an Eagle Scout project. That took up the morning. After lunch, I had to go to town to get some groceries and buy some wine. I ended up going to Cedar Park which is about 15 miles away. In that community, I found a place to order some wine, and was able to get a haircut at Wal-Mart. For a change, I wasn't scalped! ;) I also did my grocery shopping there and headed back to camp. After unloading the groceries and taking Emma out for a walk, I resumed my work on making this site a home for the next three months. I relocated the DISH and was finally successful in finding the satellites, connected the water hose, and brought out my table so I could set up my gas grill. I also took the tomato plant that has been residing in my shower and put it on the table. Last summer I had a tomato plant and just put it outside the motorhome. The local rabbits had a feast on it the first night and destroyed it, so I'm a little wiser now and put it up above their reach. I think it was in December that I bought a new lawn chair that is a rocker. Since the sites here are not paved, it's a little difficult to rock on rocks! I found two short sections of 2X4's and put them under the chair. Yahoo! Now I can rock to my heart's content. This is the most comfortable lawn chair that I've ever sat in. So, my three small victories today were the rocker, the DISH, and getting a decent haircut. What more could a person ask for? I was able to get everything packed and hitched up by 9:30 this morning, so I pulled out about a half hour behind Pam and Stan. 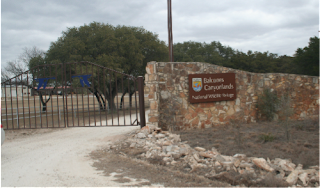 While they are headed back to the cold of Chicago, I'm heading mostly west to Balcones Canyonlands National Wildlife Refuge for a three month volunteering stint. While the total trip was only 128 miles, it took me about four hours. On the way out of the campground, I had to dump the tanks and then I went into Somerville to fill my propane tank. That little side trip added about eight miles and forty-five minutes to the journey. I also filled up on gas along the way and stopped for lunch at a roadside picnic area. By the time I made it to the Refuge Headquarters it was 1:30 and the temps had risen into the seventies under sunny skies. Dub, one of the local volunteers, led me to my campsite which is up the hill behind the main offices. I thought I was going to be at a different location, but another volunteer couple arrived before me today and they were placed up at the ranch. 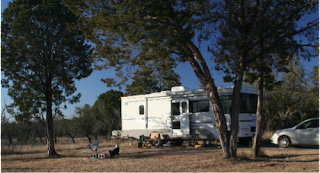 It turns out that my site is pleasant and isolated, but doesn't have the vistas that I heard of at the ranch sites. A new shed has been built that has a washer and dryer, so at least I won't have to drive ten miles to do the laundry. After getting the basic set up chores done, I started some laundry and then started to work on setting up the DISH satellite. I was able to hone in on the satellites at Lake Somerville SP in less than five minutes, but it wasn't to be at this site. After four hours, I gave up and switched to my antennae for the night. At least I'll get some local channels from Austin. I haven't had this much trouble with the DISH in over a year, so I am very frustrated to say the least. I'll give it another go tomorrow. Since my cell phone reception was poor, at best, I also set up the trucker's antennae once I gave up on the DISH. The reception with the Wilson's Amplifier shows full bars, but my air card reception is still spotty. I'm not sure I'll ever be able to post pictures at this location. We'll have to see what happens as time goes by. I'm tired tonight after all the messing with the satellite dish and the packing and unpacking. Tomorrow, one of the other volunteers is picking me up to show me some of the trails in the refuge. I need to go to town in the afternoon to find a grocery store. I'm just about out of milk. Yesterday was a non sight seeing day, and another day to just enjoy Lake Somerville State Park. The weather was outstanding; sunny and warm. Oh yes, it was also Super Bowl Sunday, which was very important to Stanley. Pam and I are not so interested in football so we appreciated the fine weather and used the time to walk the dogs on several more trails. Then we had steaks for dinner before the game began, of course. As Emma and I sat outside watching the sunset, many deer were moving around just outside of Emma's reach. Her nose was working overtime! This morning, we headed out in the car for Brenham. Brenham is the home of Blue Bell Ice Cream and we planned to tour the ice cream plant. First on the agenda was to find a place to eat breakfast, and we stopped at the Bread Basket Cafe in the historic downtown area. When we arrived, we were the only diners, which gave me a moments pause, but soon others arrived. I can never seem to make an over easy egg the way a diner can, so that's what I ordered. Pam and Stan both had omelets. The food was tasty and the service was fast, so we were able to make the 10:00 tour at Blue Bell. I had forgotten to bring my camera with me this morning, but pictures weren't allowed on the tour so I didn't feel too bad. I enjoy tours that show me how things are made, and this tour did not disappoint me. The cost was $2.00 for seniors and lasted about an hour. It began with a humorous video on the history of the company, and ended with a large serving of one of 24 varieties of the different kinds of ice cream that are produced at the plant. If I remember correctly, Blue Bell presently makes 51 different products. The only disappointment of the morning was that they don't sell any ice cream at the plant. I would have liked to buy a pint of chocolate covered strawberry. If you love ice cream, this is the place to work. Any employee can eat as much ice cream as they like any day that they work. That little fact made me think of the "I Love Lucy" episode where she worked in a candy factory. Our tour guide was a sweet young thing, about as big around as a toothpick, that said she ate ice cream every day at work. It's a good thing she's young. When we drove back to the campground, I noticed a sign at the entrance that said the park was now under a fire ban. We had planned to have one last campfire this evening before we all leave tomorrow, but that didn't happen. I spent the afternoon doing some preliminary packing for my departure and cooking country style pork ribs on the charcoal grill that is provided at each site. I also made some Cole slaw. I like my own recipe for Cole slaw and this was a great opportunity to have some. Making Cole slaw for one, just isn't an option. I look forward to tomorrow. It's always exciting to arrive at a new assignment and get an idea of what new experiences will be on my horizon.